Needless to say I didn’t get the twenty dollars. Apparently, I know my film editing and visual effects though. But you know what? That’s ok. Here’s why. This year’s Oscars wasn’t about me, or the 18-34 demographic. 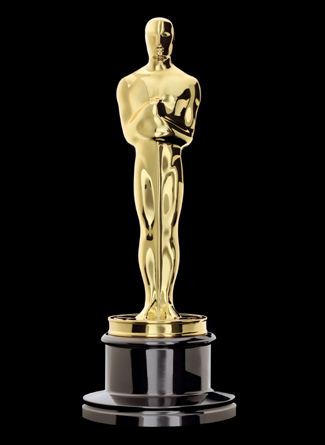 This was an Oscars for an older generation looking back. The “Night at the Movies” theme centered around nostalgia. Silent movie The Artist won Best Picture. A film sketch featured modern comedians parodying a Wizard of Oz screening. Old-fashioned theater girls passed out popcorn and Billy Crystal sang a medley. Appealing to this audience makes sense when you think about it. These are the people most likely to enjoy the Oscars. Just look at the makeup of the Academy voters. This article reports that the Academy’s median age is 62 and less than 14% of the voters are below 50. No wonder my guesses were totally wrong! Compare this year’s Oscars to last year’s. With young hosts Anne Hathaway and James Franco and a theme of “You’re Invited”, the Academy was specifically inviting the 18-34 to join in the show. Watch the producers explain their younger demographic pitch in less than a minute. Pretty different feel than this year. How’d that work out for them? It bombed. Critically and in ratings. Ouch. This year fared much better. Both ratings and social media favored the 2012 ceremony’s loyalty to this older demographic. A Huffington Post article reports that Nielson Co. estimated that 39.3 million viewers watched the Oscars on Sunday as opposed to 37.9 million for the 2011 show. Ironically, the 2012 Oscars focusing on an older demographic saw more action from a traditionally younger channel: social media. The same article cited a Trendrr study showing that social media actions increasing for this year’s Oscars as well, doubling from 2 to 4 million. The 2012 was a great show because it played true to it’s audience–movie lovers with enough years behind them to feel nostalgic. It felt more real and authentic than the 2011 show, which catered to the younger audience with the opinions of a much older audience. Were there moments in this show that resonated with me as a twentysomething? Absolutely. 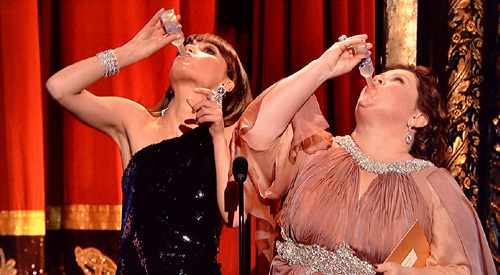 What other Oscars had a live drinking game (I love you Bridesmaids!!)? Or Robert Downing Jr. Tebowing? Or (please forgive me English Lit professors) a Twilight reference in the romantic movie clip montage? Unlike the Grammy or MTV Awards shows, The Oscars aren’t all about my demographic. And they shouldn’t be. I’ll enjoy the show for being itself and, more importantly, so will it’s primary audience. Just give me a few moments like this and I’ll be happy. This is really good stuff Lindsey. You really have a good understanding an take on the current 18-34 demo. I enjoy reading your commentary. Best of luck on your job search as well! I ‘m glad to hear that you’re enjoying my posts. I’m keeping my fingers crossed on the job search front, but a little good luck never hurts too. Thanks! Hello! I just would like to give an enormous thumbs up for the good data you’ve right here on this post.